Can You Reduce Any of These 10 Fixed Expenses? *Read these articles first, if your time is limited! All webinars begin at 8 p.m. CENTRAL and will be recorded. The links for the recordings will be posted here. Tuesday, June 21, 8 p.m. CENTRAL: “How to Be a Prepper” webinar with Lisa Bedford. Thursday, June 22, 8 p.m. CENTRAL: “Mental Preparedness” webinar with Daisy Luther. Sunday, June 26, 8.m. CENTRAL: Sunday Night Check-In with Lisa and Daisy. How many vessels can you fill with water this week? Do fill up canning jars that are sitting there, waiting empty on your shelf until you can something. Do fill up empty, clean 2-liter soda pop bottles. Do not store your bottles in places with extreme temperatures. Do rotate through your water supply just like you do any other preps. At the end of the week, figure out how many gallons of water you have stored away. We'll talk about this in the Facebook group. Does your toilet flush into a main sewer line or does it flush into a septic system? If your toilet flushes into a main sewer line, is there a valve that shuts your house off from the sewer line? If so, find out where it is and how to shut off the line to prevent back-up into your house. Get some disposables. Pick up 1 pack of paper plates, 1 pack of disposable utensils, and a pack of Lysol cleaning wipes. This will make clean-up easy during a short-term power/water outage. Begin saving empty 2-liter soda bottles. Rinse them out well, allow to air dry. Bottle caps can be run through the dishwasher, if you have one. These containers can be used to store dry foods of all types, from cornmeal to oatmeal to rice. Buy 1 package of oxygen absorbers from Amazon. Size: 50 cc. You will use one in each small size food storage container. See our oxygen absorber guide for more details. Look for the cheapest rice and beans you can find. Sometimes ethnic markets have the best deals. Buy as much as you can afford this week; you’ll be repackaging the food in the clean bottles with an oxygen absorber. Do a health assessment of each member of the family. Are there any issues, including dental, that need to be addressed? If possible, schedule an annual physical for each person to get even more information about what concerns, if any, should be taken care of. Prioritize these. Organize your gear. You probably already have numerous items around your house that are typically part of emergency supplies and bug out bags. This week, begin in one room and see how many of these items you can track down in drawers, cupboards, and other storage spaces. There’s no point in spending money on more duct tape, for example, if you already have 3 or 4 rolls scattered around the house and garage! Complete the 5-step threat assessment. Put a plan in place for surviving in your home during a summer power outage. If you have elderly loved ones, anyone with chronic health issues, or a baby in the family, make plans to evacuate them elsewhere for the duration of a longer term power outage. Buy a battery powered fan…you’ll be so happy you did if you have a summer power outage. Do a home security assessment. Think like a criminal and try to figure out the weak points in your home security. Are your locks flimsy? Are there windows that would be easy to breach? Are there any neighbors of whom you’re suspicious? Take notes – we’ll use this later! Using the Summer Prepping Intensive dividers, begin putting together your own survival binder. Make copies of each family member’s birth certificates, marriage licenses, all insurance policies (auto, health, homeowners, renters, etc.) and the front and back of each credit and debit card. Refer to the Grab-n-Go Binder printable for a complete list. Buy a 3-hole punch if you don’t already own one! This one simple tool will make it much easier to keep your binder up to date. You are doing the right thing! Don’t let people make you feel like you’re all doom and gloom. Read Daisy’s article, Prepping is the Ultimate Act of Optimism. Summer is the perfect time for yard sales. Hit the sales with your children in mind. (But not in tow – this is a grown-up excursion!) Pick up age-appropriate toys and books, and stash them away without letting the kids see what you got. Then, during a power outage or emergency, you’ll have a brand new (to them) stash of goodies to entertain your kiddos. Obviously, focus on toys that don’t require the grid to work. Take a walk. If you’re just getting started with fitness, do what you can do. Go for 15 minutes at a slow pace. If you’re in good shape, commit to walking 5 days a week. This is great for your mind and your body! Each week, we'll recommend our favorite brands and products. You aren't obligated to buy these particular items, but if you're looking for something tested and true, consider adding these to your stockpile or library. 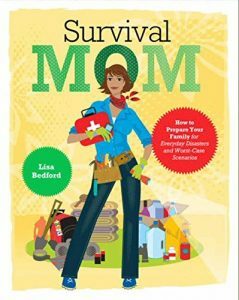 This week, one lucky winner will receive a copy of Lisa Bedford's best-selling Survival Mom: How to Prepare Your Family For Everyday Disasters and Worst Case Scenarios. This 300+ page book is a family survival manual that should be in every home. It covers everything from water and food storage to setting up a safe room. There are plenty of to-do lists, recipes, and even family prepping activities to get everyone involved. Survival Mom is a prepper classic. All SPI students are automatically entered in this giveaway. The winner will be selected at random and contacted via email on Saturday, June 25. Since we're talking about things that won't break the bank this week, how about something that will save you money? If you've had to go to the trouble of storing, acquiring, and/or purifying your water, you won't want to waste a drop, especially during an emergency. We hope you enjoy this chapter on Water Conservation from Daisy's best-selling book, The Prepper's Water Survival Guide.